Pacas have the ability to freeze in place when they are threatened for up to 45 minutes. 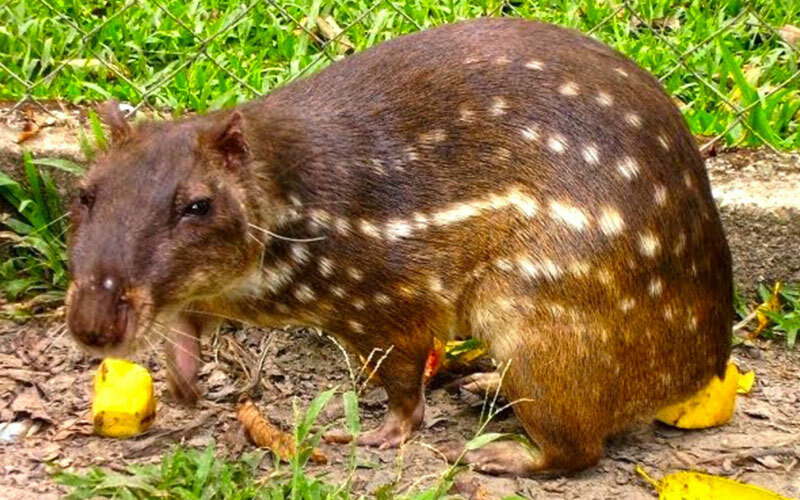 The Paca is a ground-dwelling, herbivorous rodent from South and Central America. They are large with square heads, small ears, dots and stripes on their sides and barely visible tails. Pacas grow from 20 to 30 inches in length excluding its 5.1 to 9.1 inch short tail and weight between 13 and 31lbs. They are considered to be the third and fourth largest rodents. They are known to inhabit rainforests, cloud forests and sometimes more open habitats. They are great swimmers and prefer to be near water. When threatened they dive below the water and can stay submerged up to 15 minutes. Normally passive in the daytime they forage for food in the mornings and afternoons but can be strictly nocturnal in areas with many predators. Pacas live in burrows up to 9.8 feet deep, normally with 2 entrances covered with leaves to hide burrow and to serve as an early warning system. Burrows are often near to water but always above the seasonal flood line. They feed on fruits, leaves, buds, flowers, fungi and insects.